July 29, 2013 by Venky. 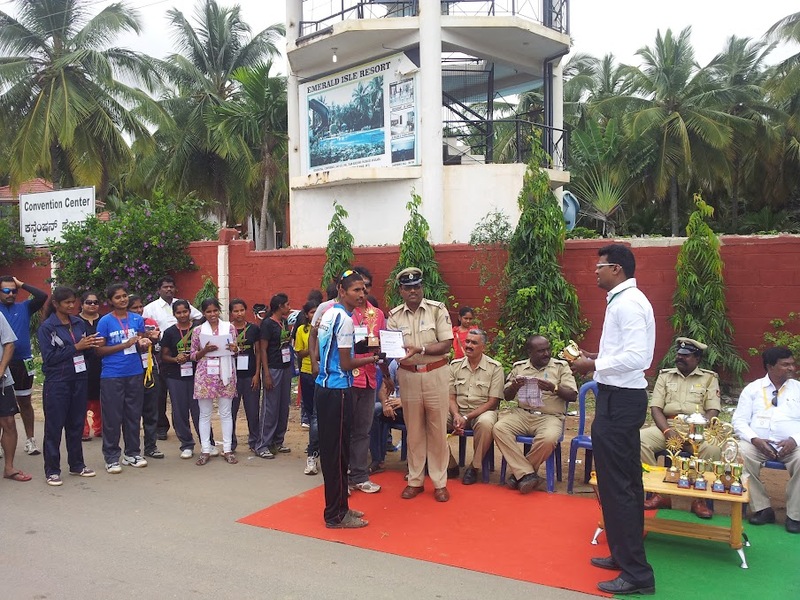 SFS Bangalore District Level Road Race! He was wavering on the bike. His prodigious upper body movement was giving away that he was running out of gas. The peloton was only a couple of bike lengths away from catching him. He takes one look back, smiles, takes the hands off the handlebars, moves them as if he were running and gives the pedals another kick to accelerate again. He was suffering but clearly the fun he was having was way more than the suffering. Or may be the suffering was fueling the fun. May be it is that aspect many of us love about racing! As the 50km open men’s race was flagged off, nearly 30 riders started out on Old Madras Road from near Emerald Isle resort in Hoskote. One side of the 4 lane highway was completely cordoned off for a little over 12km for the race and the traffic was diverted to the other side. The riders have to go up and down that stretch twice making it nearly 50km race. I found myself leading the peloton for majority of the first five minutes. With the tailwind, it didn’t take much effort but we were flying. Even at front while riding well above 40kmph we were able to chat up with each other inquiring about how each others’ training is going on etc. The first five minutes or so worked as a good warm up for me and I was asked to go back while my skipper took up the duties at the front of the peloton. The lead bunch into the second lap .. Arvind drilling it at the front! My team, Spectrum racing‘s Arvind Bhateja, Mohan Kumar, Dev Veera and I made one of the two biggest contingents in the race with the other being Student Foundation of Sports(SFS)‘s Arogya Swami Pradeep, Andrew Gerald, Praveen Kumar and Alwyn Kumar. The SFS youngsters were also part of the Under-23 race of 25km which ended before the open men’s race, stormed the podium in it and joined the open category race. Then a couple of riders from Team Trek Firefox, Sarvesh(was also part of the U-23 race where he finished 4th) and Siddarth Kansal were there along with two riders from Cleated Warriors Nalla Konar and Venkatachalam Ramakrishnan. Oluf Kristian Højbjerg Hansen, Rajanikanth Puttabuddi, Sandeep Shet, Abhishek Bhattacharya, Sanjay, Abhirama etc were there to make up the peloton. Although a few like Sandeep Shet, Sarvesh tried to share duties occasionally, the rest of the peloton was not very keen on driving the pace especially against the headwinds on the return. So, Spectrum decided to take responsibility of driving the pace and set up a relatively gentle pace especially for the first lap. There were a few attacks that we managed to shut down and the pack more or less stayed together. There was some nervous riding involved in the peloton with riders coming too close to each other or some wheels touching. But thankfully, no one tumbled and by second lap it was a much less nervous peloton. The youngsters from SFS were quite active throughout the race! As we approached the start to begin our second lap and took the U-turn, Andrew Gerald of SFS launched an attack and broke away. We looked at each other in the peloton and decided not to worry about it. We decided to just keep him in sight and wait for him to get tired. We knew with about 24km to go it is unlikely that he would outlast the peloton especially with the strong headwinds after we take the final u-turn. So, we raised the pace slightly to keep him in sight and kept it steady. I have to say I was surprised how long he lasted. He participated in the U-23 race(25km) and finished second in a bunch sprint before joining the longer Open men’s race. I would have thought that would deter these guys from attacking too much. But I was wrong and he not only attacked but was holding his own against the peloton for more than 10km. As we approached the final U-turn before we turn to the last stretch of 12km, he was wavering on the bike. His prodigious upper body movement was giving away that he was running out of gas. Arvind was drilling it at the head of the peloton to chase him down. Then I moved ahead to give him some respite. We were only a couple of bike lengths away from catching him. He takes one look back, smiles, takes the hands off the handlebars, moves them as if he were running and gives the pedals another kick to accelerate again. He was suffering but clearly the fun he was having was way more than the suffering. He was caught by the peloton at the U-turn and happily joined the lead bunch on the home stretch. Amazing what these young blokes can do. Andrew Gerald in a solo break that animated the race in the second lap..
Once we took the final U-turn it was the last 12km to the finish line. Mohan suggested that I get back for a bit to recover and attack on one of the two inclines ahead to try and split the bunch further. I wondered if I had any matches to burn to make it happen but decided to try it anyway. Oluf attacked on the first incline but the bunch quickly got together by the time we reached the top of the incline. Then about 6km from the finish on the second incline, I got off the saddle and drilled it. I quickly lost the gas but Arvind took it up and drove it for a bit more. That resulted in a the final selection of eight riders but Arvind and I got dropped after the effort. Nalla was with us. The lead bunch was about 100-200m ahead of us but we couldn’t quite make an effort to catch up. We were content with the fact that our teammate, Dev was in that group and hoped that he will be able to finish well. We kept the lead bunch in sight and picked up the pace after recovering a bit. We noticed Rajani getting slowly dropped from the lead bunch and decided to bridge up to him. We caught him with about 2km to go and lost Nalla in the process. As we approached the finish line we were more interested to see the action up ahead rather than our own finish. As the riders opened the sprint before the line, Siddarth Kansal of Team Trek Firefox, timed the sprint to perfection and finished a couple of bike lengths ahead. Dev, of Spectrum Racing, who opened his sprint a little too late ended up second in a photo finish with Arogya of SFS. Content that our teammate finished on the podium I found my legs again to sprint to the line and congratulated the guys. What a race it was! Men’s Open winner, Siddarth Kansal.. Under 23 race was for 25km and had 8 participants. It ended in a bunch sprint and the strong SFS contingent of Arogya Pradeep, Andrew Gerald, Praveen Kumar finished 1st, 2nd and 3rd respectively. Sarvesh the wafer thin climber from Trek Firefox was trumped in the sprint and finished 4th. All four participated and finished in the lead bunch that contested the win even in the open men’s category race. These youngsters are quite impressive. Women’s category race was also for 25km and had 5 participants. Vicki Nicholson of Spectrum racing finished some 9 mins ahead of the rest of the field of young girls from SFS to win the race. She was followed by Leelavathi and Majula of SFS for 2nd and 3rd places. They have also awarded a team prize for the team which performed well in all the races. SFS has rightly won the team championship prize for the great show from their youngsters. The race was brilliantly organized. Although we were delayed by about half an hour at the start waiting for the U-23 and Women’s races to finish before we started our race, it was completely worth the wait. The closed roads and the police and volunteer presence at the intersections meant that we could completely focus on the racing without worrying about our safety. The registration and bib collection etc was quite smooth. They had ex-cyclists who competed in national level events to organize and time the event and they knew what they were doing. There was even post race nutrition available for the riders. The officials giving out prizes to the cyclists is nothing new. 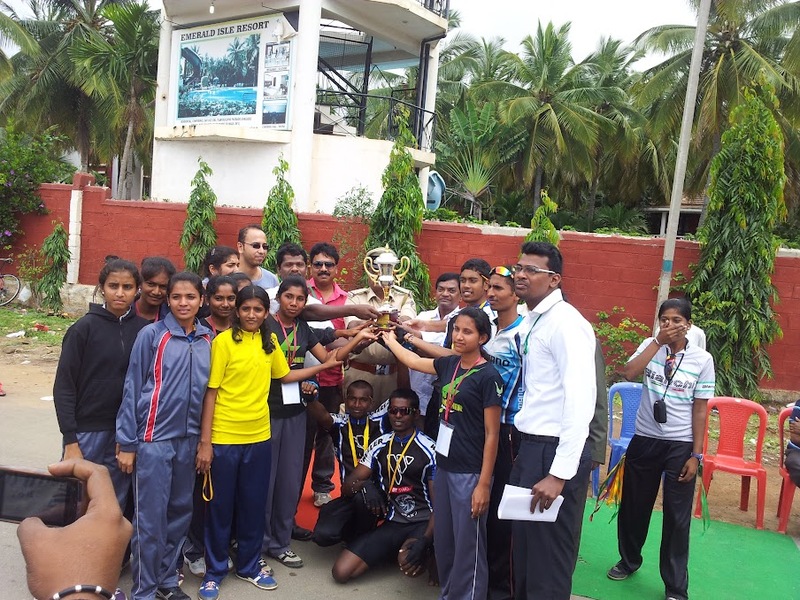 But the organizers made the cyclists give out token trophies of appreciation for the police force and the state and district level cycling federation officials who were present there which was a nice touch. It was also announced that the top 6 finishers will be sent to the state level meet that is going to happen in September. For the race itself(Open men’s race that I was part of), the field was more or less evenly balanced in terms of rider abilities and the flat course meant that most of the riders were able to stay in the bunch for majority of the race. The strongest riders made it to the final selection and the winners were determined by a strong sprint to the line. It was picture perfect in many ways. Loved being part of it. I hope SFS would be able to conduct more of such races in future. Kudos to Amarnath Jayaraman of SFS and his team. Photos from my cell are here and here. Brilliant Veloscope photos here. Previous Racing Fun Begins At The BAR – Bangalore Amateur Racing!